Too often, plastic bags, crushed water bottles, and candy wrappers litter the scenery when trekking and camping. We’re so used to flushable toilets, regular garbage pickups, and pre-packaged food that when we get out into the ‘real outdoors’ we don’t think about our impact on the environment. Leave No Trace (LNT) is a set of seven international principles to help reduce the human impact on our natural surroundings. It combines science and common sense for hikers, campers, bikers, runners, hunters, paddlers, fishers, skiers and climbers to responsibly enjoy the outdoors. Millions of people around the world are either trained or aware of the LNT principles. LNT Principle: When you plan your trip poorly, you usually resort to higher-impact solutions. Some of these may include an improperly arranged campsite, unsuitably located campfire, and excessive trash through poor meal preparation or inefficient cooking equipment. Our Trek: Even though our driver forgot to pick up the chef before starting the trek, everything else was planned meticulously by our guide. We, trekkers, didn’t have to worry about campsites, food, horses, tents or any other equipment, but from what we saw, the guide planned everything for minimum impact. LNT Principle: Damage occurs to the land when it is trampled by foot or more seriously a tent. For high-use areas, concentrate your activities to those areas so new areas of impact aren’t created. But the opposite advice is given for low-use areas: it’s better to spread activities out to avoid creating a high-impact area in the first place. Our Trek: The Lares Trail isn’t as established as the famous Inca Trail, so we weren’t restricted to camping in predetermined areas. Although we could choose anywhere to camp, we generally chose very small permanent camps. So small in fact that we were the only ones there! LNT Principle: The ‘Pack it in, pack it out‘ slogan is a philosophy based on whatever a person brings into a natural area, must be taken out. But water and human waste are a little tricky. Soap and dishwater should be far away from natural water sources to avoid contamination. Catholes are recommended for human waste, 6 to 8 inches deep and 200 feet away from water to prevent the spread of disease. Our Trek: Our porters set up a makeshift toilet sealed with a plastic bag, inside a teeny tiny tent for our group to use. This incredibly made little to no human waste impact on the land we traveled through. LNT Principle: A lot of people like to collect keepsakes in the form of rocks, plants or other archaeological artifacts when they travel. Firstly, a lot of these things will be confiscated at the airport, but also, future travelers want to discover these things too. Instead, why not support the local communities through buying ceramics, handicrafts, drinks, and traditional foods. Our Trek: We passed through a few small communities on our trek where women and children would run up ahead of us to secure a spot on the trail where they could display their crafts, pose for pictures and of course, sell us Coca-Cola. LNT Principle: Basically, restrict campfires to existing fire pits. Not only do fires cause degradation to land, but they increase the demand for firewood and increase the risk of wildfires. Try to only use firewood and kindling (tinder) on the ground; you don’t need to get all macho with an ax. Our Trek: I was so keen to put my Girl Guides skills to the test by building our campfire. But for environmental reasons, our guide was against it. The high winds meant the fire could spread easily, not only endangering us, but also the surrounding woodlands. LNT Principle: Yes, we all like to get up close and personal with animals, and we all think there’s a deep connection when they stare into our eyes with a loving desperation for the food we hold. But leave it for your next visit to the zoo. When wild animals become dependent on human interaction, ecosystems suffer greatly. Our Trek: Although I was constantly sweeping the skies for condors and the hills for pumas, we didn’t come across much wildlife on the trek. There were plenty of dogs, llamas, and alpacas to keep us entertained, but they were all part of a family or herd. Perhaps the absence of wild animals is due to prior hunting and human interaction. LNT Principle: Basic etiquette really… if you’re awake, don’t be too loud; if you’re sick, try not to spread it to others; and if you have to impact the environment with waste, be discrete. Our Trek: Consideration of other visitors wasn’t high on our list, as we didn’t see anyone else. But I can safely assume this is a big issue for those considering the much more popular Inca Trail. 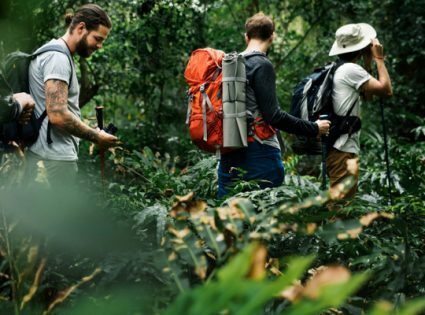 The Leave No Trace principles aren’t exclusively for hiking and camping; you can use them for all types of travel and life in general. Sure, the impact of your actions may not be a high priority when you’re on the other side of the world, but it’s one of the first steps to becoming a responsible global citizen. Otherwise, the only place left for adventure will be outer space.